This summer, as the world prepares for the Olympic Games in London, Bermuda will be hosting games of a different origin. At the Sandys 360 complex in the West End, there will be a competition to see who can toss a long heavy wooden pole as accurately as possible, to see who can complete a 5K obstacle course in the shortest time and to determine which tug o’ war team is the strongest. In other words, the Island will be hosting its first ever Highland Games, which, in addition to a host of ‘field’ events will include Highland dancing competitions and bag piping demonstrations. Special guests at the games will be members of the Atholl Highlanders, which is Europe’s only legal private army. The Caledonian Society of Bermuda in conjunction with the Bermuda Islands Pipe Band and Highland Dancers will be hosting the event, supported by the Bermuda Regiment. Organisers believe the Games, entertaining and highly colourful, will be well-received by residents and visitors alike. This is intended to be very much a family event, and there will be contests in which members of the public will be invited to participate. Among these will be the 100 yard dash for adults and children. The ‘kilted dash’, for runners wearing kilts, should prove particularly spectacular. There will also be a great deal of activity to appeal to spectators. The Highland dancing competition will run throughout the evening, punctuated by demonstrations put on by highly competent pipers from Bermuda and overseas. Chieftain of the Games and Caledonian Society of Bermuda President, Scott Devine said, “As president of the Caledonian Society I’m delighted to announce the first ever Bermuda Highland Games. The society has worked long and hard to promote all things Scottish in Bermuda and the Highland Games is the ultimate Scottish event. 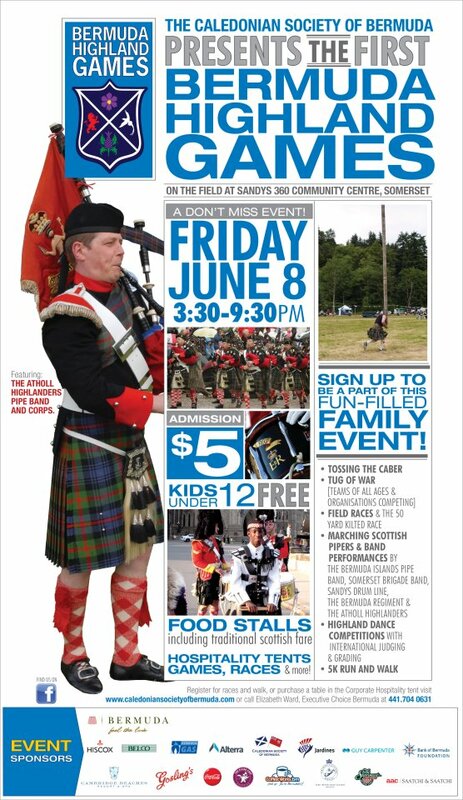 We look forward to welcoming the entire island to the Sandys 360 facility to sample traditional Scottish games, like tossing the caber, tug o’ war, musical displays and highland dancing competitions. The whole event will run alongside the visit to the island of the Atholl Highlanders regiment who will be performing throughout the day along with the Bermuda Islands Pipe Band, the Bermuda Regiment Band, the Somerset Brigade Band and the Sandys Drumline. The day is shaping up to be a great spectacle and lots of fun for the entire family. We hope people will come out and enjoy a great day of fun, games and all things Scottish”. Food and drink will be available for purchase at a number of different food stalls, With an admission price of $5 per adult and children under 12 years free, this will be an inexpensive way for families to enjoy healthy exercise and build a sense of community. Events begin in the late afternoon, at 3.30pm and will continue into the evening, with closing ceremonies planned for 8.30 which will include a march past by the participating bands. On the following day, Saturday June 9, the 56-strong contingent of Atholl Highlanders will be taking part in the Queen’s Birthday parade along Front Street in Hamilton.